What Is Binary Synchronous (Bisync) Protocol? Bisync is an acronym shortened from "binary synchronous". 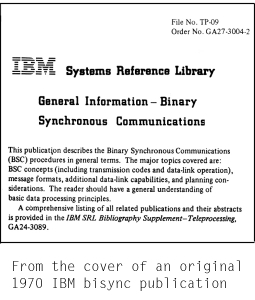 Bisync is one of the names commonly used when referring to a synchronous communications protocol introduced by IBM back in 1964 with the introduction of a product called the 270X Transmission Control Unit. The full name of the protocol is the "Binary Synchronous Communication" protocol. This is usually abbreviated to "BSC". Whenever you see the terms "bisync" and "BSC" in conjunction with communications protocols, they are referring to the same thing. Furthermore, over the years, other terms have come into use and are often used interchangeably with bisync and BSC. For example, "3780 protocol", "3780 bisync", "2780 protocol", "2780 bisync", and "2780/3780 protocol". While technically these terms may be inaccurate, they do have a practical basis and convey meaning. To be precise, 2780 and 3780 were model numbers of IBM remote job entry (RJE) data terminals -- namely the IBM 2780 Data Communications Terminal and the IBM 3780 Data Communications Terminal . These terminals used punch cards and consisted of a card reader, a card punch, and a line printer. These terminals used the bisync protocol to transmit and receive data with an IBM mainframe computer. Usually dial-up or leased telephone lines and 2400 baud Bell 201C, and then later via 4800 baud Bell 208A/B, modems were used to connect the terminal and mainframe. The 3780 terminal was a later model and used a more robust version of the bisync protocol -- hence the terms "3780 bisync" vs. "2780 bisync". Virtually all bisync in use today conforms with the 3780 version. So, what does this ancient protocol and these terminals have to do with today's PC and Internet dominated world? The reason amounts to something of a computing history lesson. While it is true that IBM 3780 and 2780 terminals are museum pieces today, the underlying bisync protocol became the defacto standard file transfer protocol for a wide array of computing devices in the 1970's and 1980's. Much like Zmodem and FTP today, if you needed to get a file from one machine to another during that time, very often the bisync protocol was used. And bisync wasn't strictly used in "pure" computers. The bisync protocol ended up in ATM machines, check sorting machines, radar systems, cash registers, and countless other devices. This massive array of hardware does not disappear overnight. There is still a huge installed base of bisync-equipped machinery in North America and to a lesser extent in the rest of the world. If somehow all of the bisync interconnected machines in the world were to stop all at once, the results would be catastrophic. Many banks would cease to function. Some air traffic control systems would collapse. Many of the point-of-sale systems in retail stores would fail. Many credit and debit cards would become useless. EDI (electronic data interchange) networks that manage much of the business-to-business commerce would crash, We don't mean to suggest that there would be a total collapse of all, or even most, of these systems but nonetheless, bisync is still a vital link in the chain of the world's computer infrastructure. Bisync is dying away, Slowly. IBM abandoned bisync years ago in favor of its SNA (Systems Network Architecture) connectivity model. (This lead directly to the IBM 377x terminal which was a successor to the 3780 -- a diskette drive was added and bisync was replaced with a new protocol compatible with SNA.) This abandonment, however, did not erase the bisync protocol nor its huge installed base. But it did open the door for specialty companies, like Serengeti Systems, to expand into this niche market. Bisync questions? Call or e-mail us.